Aylesbury FC and Aylesbury United will have to do it all over again after their Evo-Stik League Southern Division One Central match was abandoned at half-time on Tuesday after the floodlights failed. In what action there was, FC’s Gareth Price came closest early on when his weak shot was directed straight at United goalkeeper Zaki Oualah while Brian Haule was adjudged to be narrowly offside when he found the net. The Ducks then had the clearest chance of a tight first half just two minutes before the break as a ball whipped in from the right was put just wide by captain Jack Wood sliding in at the back post. United had another good chance on the stroke of the break as a free-kick from the right from Jake Bewley was headed just wide of the post by Wood. Overall, it was a tight first half, with the expected edge of a local derby, in which both teams had periods on top as well as a couple of chances each to break the deadlock. 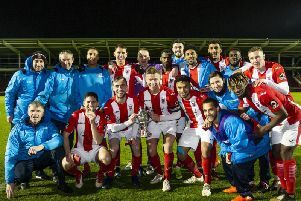 However, it was events off the pitch that then took centre stage as during the half-time break the floodlights went out and after a delay of thirty minutes, it was confirmed that the match was abandoned. Aylesbury United manager Glyn Creaser said afterwards: “It was quite end-to-end. I don’t think the surface really suited either side. “FC started brightly and quite physically but after that I thought it was a pretty evenly matched first half. “I can’t fault the lads effort and determination in recent weeks – we have managed to pick up a few good results. Aylesbury FC manager Steve Bateman said: “I would like to think that after what I said at half-time I would have got a response. “I don’t think we looked at it in the first half but that said I don’t think they really hurt us. “They looked like a team scrapping for their lives. The worrying thing for me is that we were second best and one or two of them looked quite flat and jaded. Aylesbury FC: Varnica, Prosper, Murphy (capt), Tomlin, Anthony, Stevens, Price, D Haule, Smith, B Haule, Schmidt. Aylesbury Utd: Oualak, Brown, Bewley, Wood (capt), Crook, Owens, Brito, Williams, Shrieves, French, Coulter.